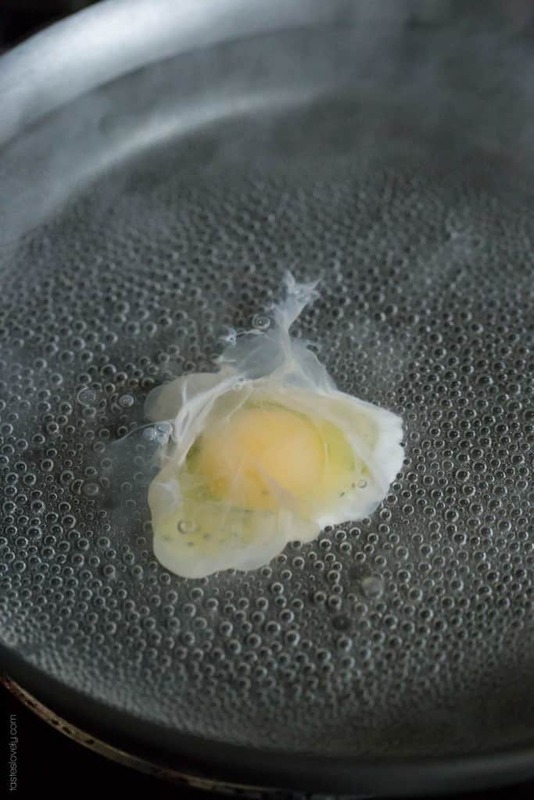 Step-by-step photos to share exactly how I poach an egg so it turns out perfect every time. I absolutely love eggs. I love eggs so much, I got 7 chickens just so I can get the freshest eggs as possible. And now I have more eggs than I know what to do with, and it’s the best problem ever. 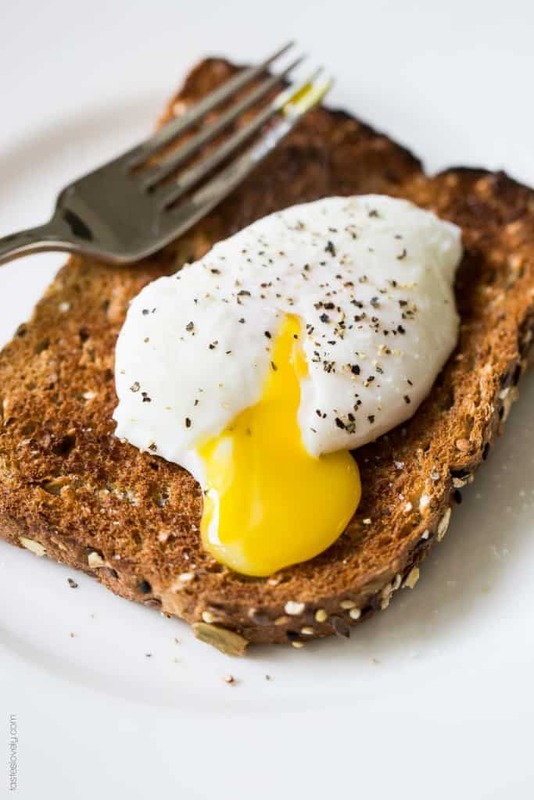 My favorite way to cook eggs is to poach them. Soft, pillowy whites with extra runny yolks. Perfect on top of toast for breakfast or lunch. Plus, it’s a really healthy way to eat eggs. 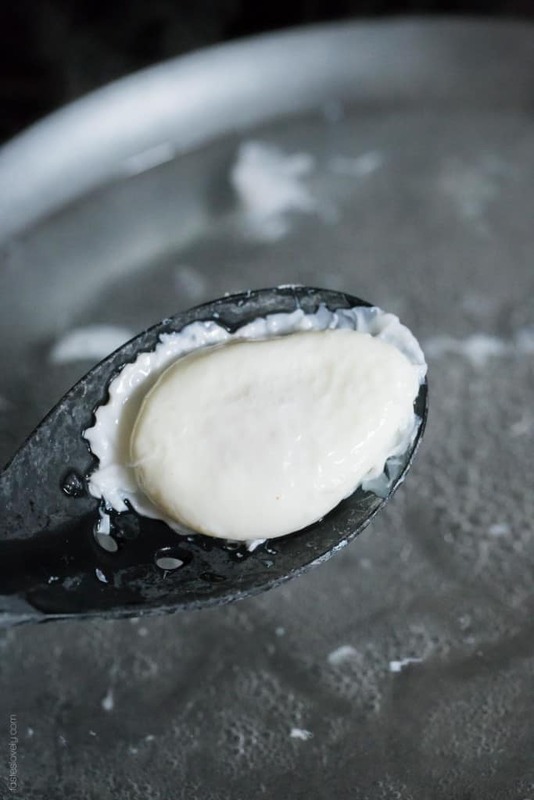 No added cooking fat or dairy, just poached right in water. I was always extremely intimidated poaching eggs. I tried it one time when I was first learning how to cook, and it was such a fail. After some practice, I can now poach eggs without even thinking. They turn out perfect every time. A lot of my egg poaching success is thanks to having the absolute freshest eggs possible. Usually no longer than a day old. The eggs in the grocery store are usually weeks old. 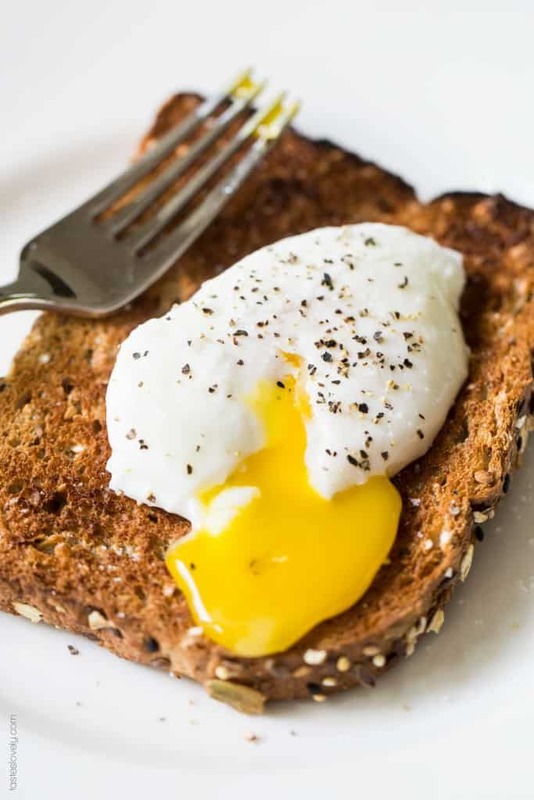 The longer an egg sits, the “looser” the egg whites get. I never noticed it until I got fresh eggs. When I crack my fresh eggs, the whites are so thick and strong. I highly recommend getting the freshest eggs you can get your hands on. Before getting chickens, I would get mine at the farmers market. I knew those eggs were just a few days old. You want to start off with a tall sided skillet, at least 2″ deep. Fill the skillet with water, and heat the water over high. 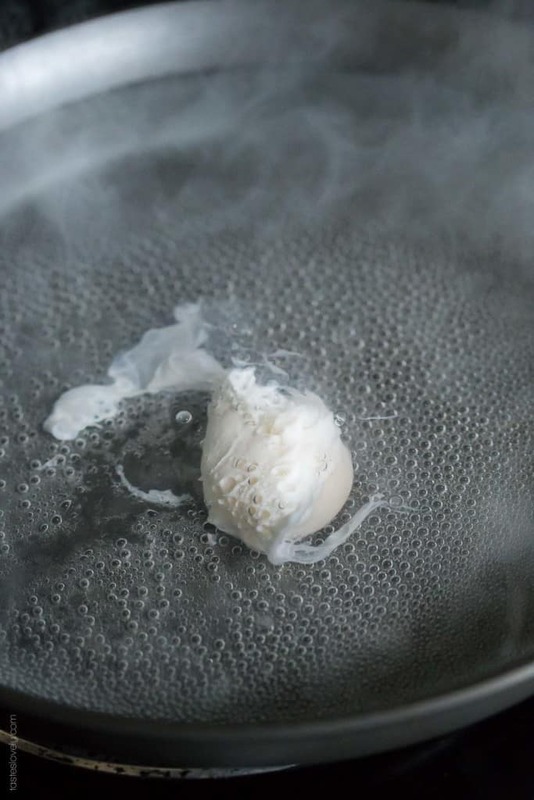 As soon as small little bubbles start to form on the bottom of the pan, crank the heat down to medium. The water is now the perfect temperature. 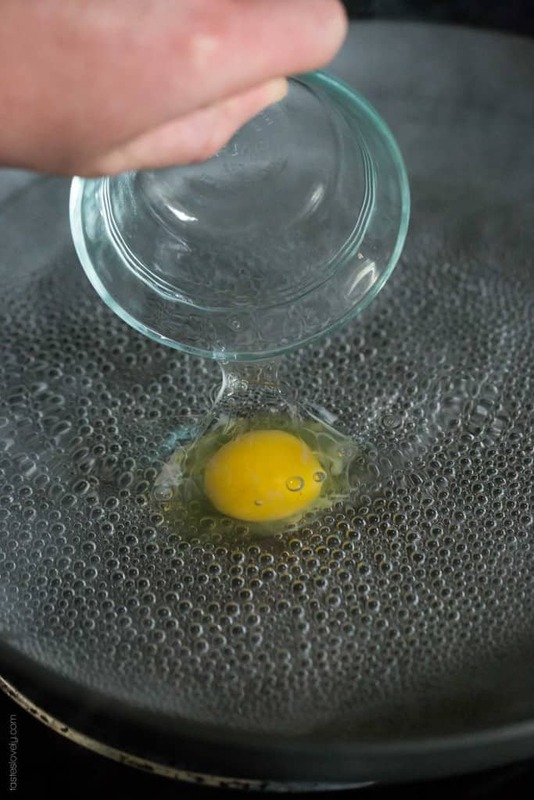 Crack the egg into a bowl, and gently pour it into the water. See how tight those egg whites are? Way better right? And that bright yellow yolk? Gorgeous! Fresh eggs really are way better than store bought. Since my eggs are so fresh, I don’t have to do any of the “swirling the water” or “adding vinegar” tricks to keep the whites intact. 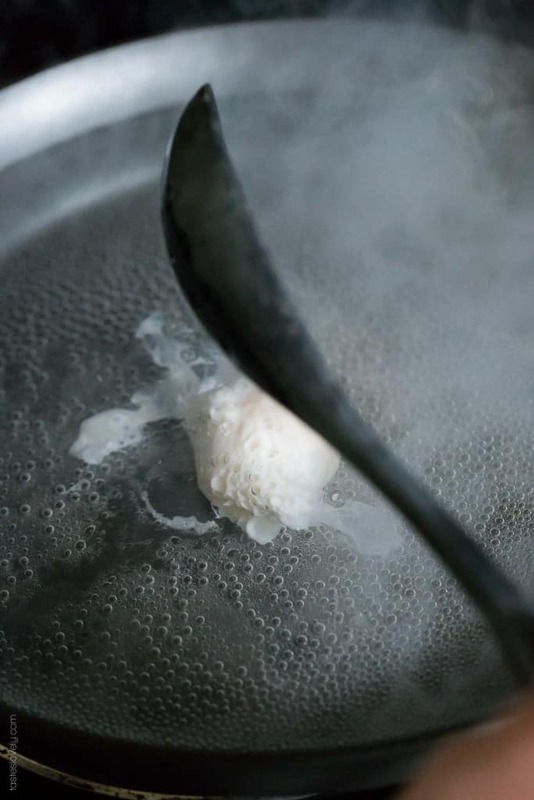 But if your egg whites start to run, gently use a spoon to nudge the whites together. 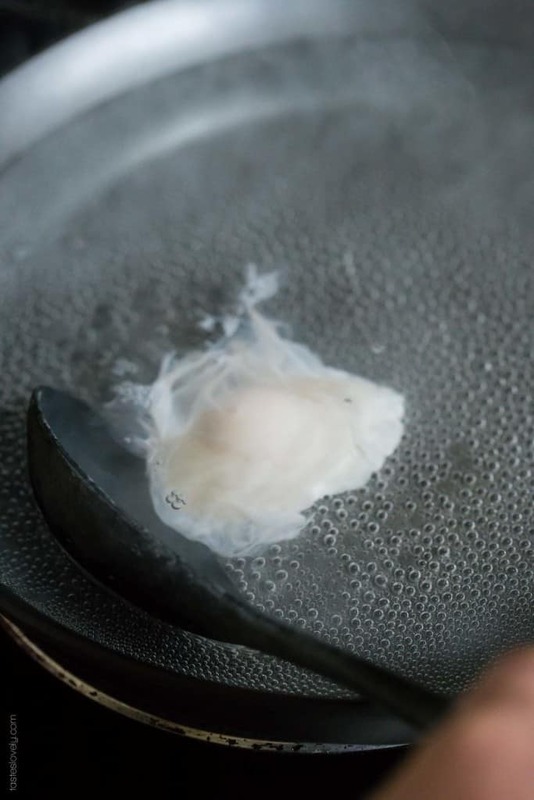 Let the egg sit in the water for about 30 seconds, until the bottom of the egg whites are white and you can’t see through them to the bottom of the pan anymore. This is after 15 seconds. The bottoms are more white, but I can still see to the bottom of the pan. I still need to wait a bit longer. Now it’s been about 30 seconds, and this egg is ready to flip! The bottoms are white, and I can’t see through it. I use a slotted spoon, and gently nudge my way under the egg. Once I’m under about half the egg, I give it a gentle little flip. See how it stays together? By waiting until the bottom of the egg was white and not see through anymore it stays intact. A few of the looser, outer whites usually break off like this one did. That’s just fine. A successful flip! Once it’s flipped, I set my timer for 3 minutes. During that 3 minutes, I’ll nudge the egg a little bit around the pan, just to make sure it isn’t touching the bottom and getting too hot. After 3 minutes I lift it out of the water with a slotted spoon. I use my finger to lightly press on the egg to test if it is done. 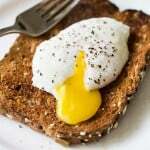 I want to whites to be a barely jiggly and set, and the center of the egg where the yolk is to be really jiggly. If the whites seem too jiggly, I’ll put the egg back in to cook for another 15 seconds and test again. 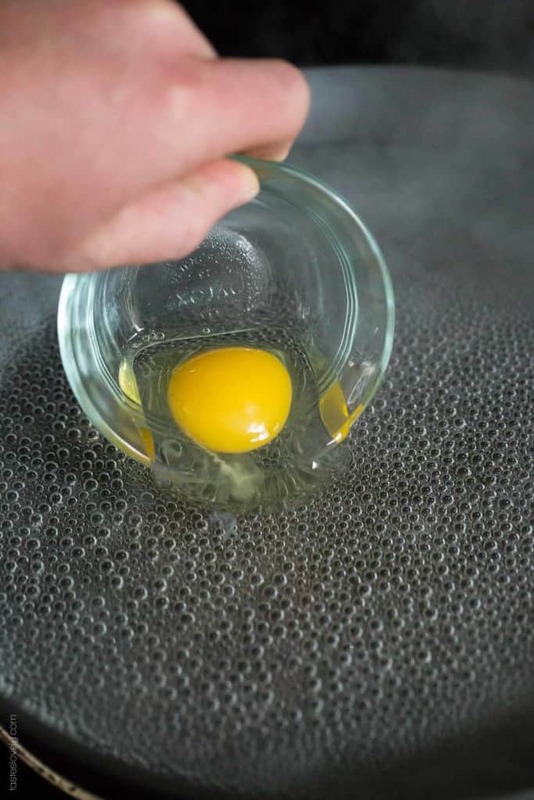 I transfer the cooked egg to paper towels to drain off excess water. I can only cook 2 eggs at a time successfully. If I get too many eggs going, I lose track of which egg I put in when and an egg will get overcooked. The worst! 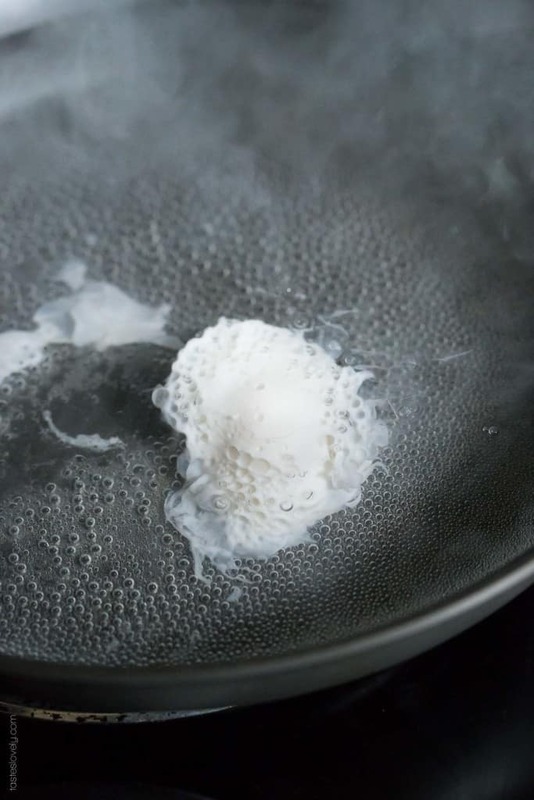 The cooked eggs are fine at room temperature while I cook the rest of the eggs if I need to poach more than 2. When I’m ready to eat them, I’ll sprinkle them with some salt and pepper. My favorite is on plain wheat toast. I’ve been eating this for lunch for weeks and look forward to it all day! The best part is cutting in to it and seeing those gorgeous yellow yolks run out. 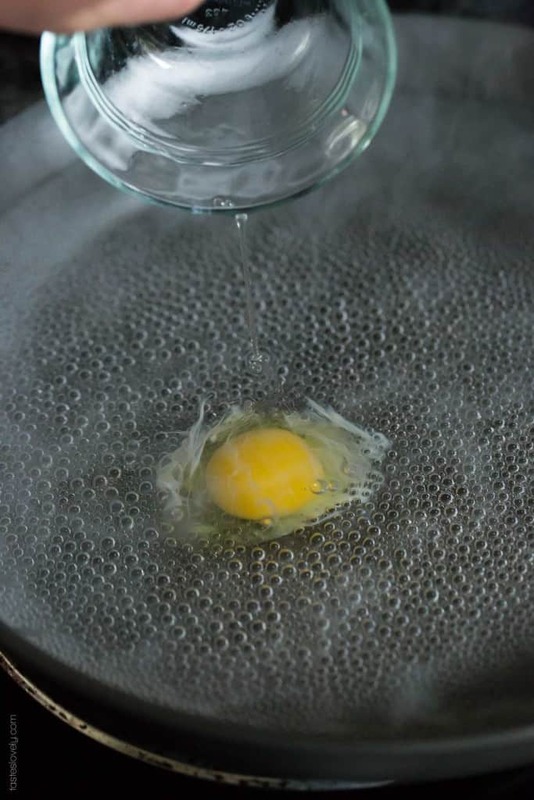 Let the egg sit in the water for about 30 seconds, until it has turned white on the bottom and you can’t see the bottom of the pan through the egg anymore. Then, use a spoon and gently flip it over in the water. Continue to cook for another 3 minutes. 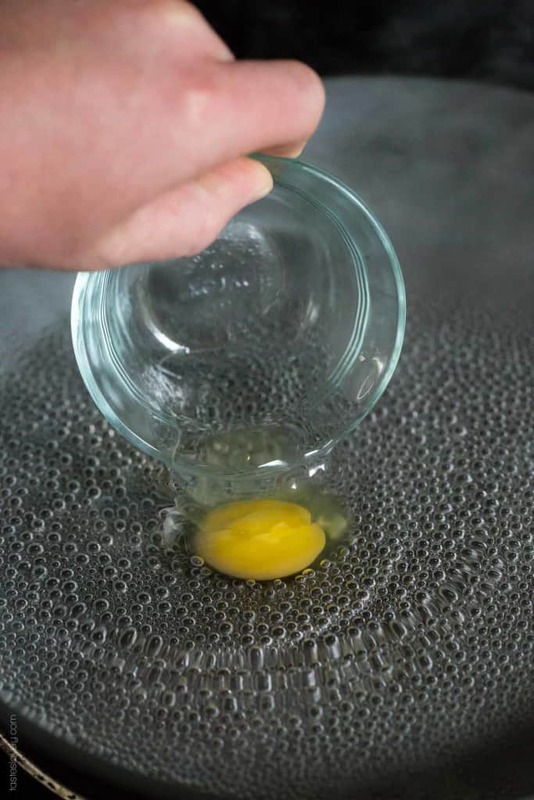 You will know the egg is done when you lift it out of the water with a slotted spoon and the whites are set, but the center is still jiggly. 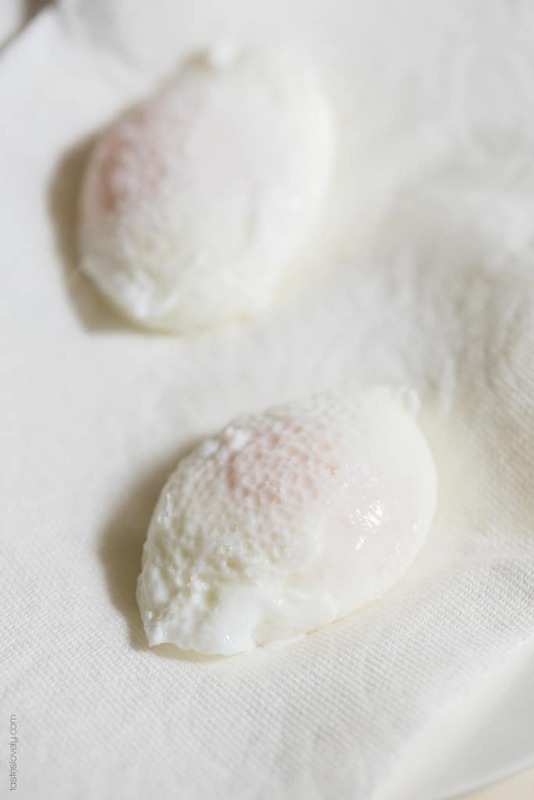 Transfer the poached eggs to the paper towel lined plate to drain the water. Serve over toast, or on pasta, or salad, or any way you choose. Sprinkle with salt and pepper before cutting in to it. I love my eggs with a runny yolk, but I’m a little embarrassed that I’ve never poached an egg before! I’m so giving this a try, Natalie! 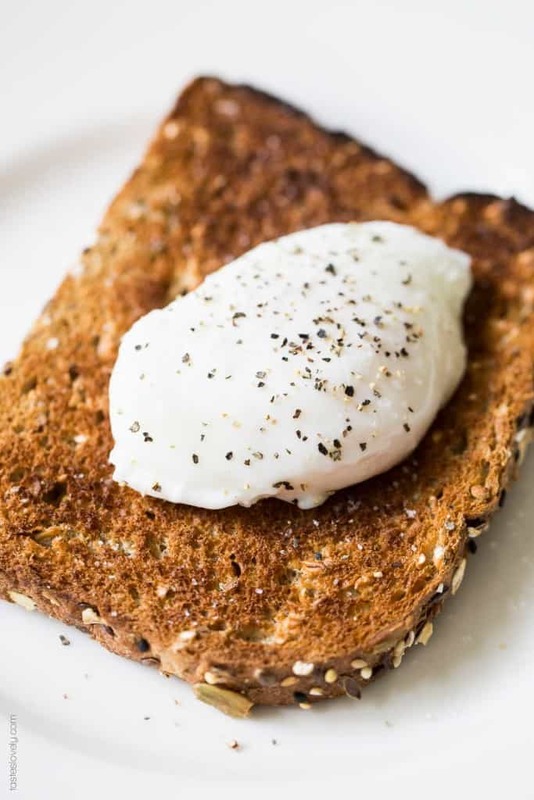 I hadn’t poached an egg until about a year ago. But now it is my favorite way to cook them! Give it a try Danielle! How long do the eggs keep? 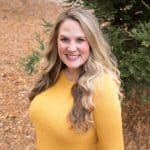 Do you need to eat and serve right away? They keep for up to 5 days in the fridge! To reheat, just submerge in warm water for 1-2 minutes.